Saturday morning, Kate and I went to a Family History Fair at the Hennepin County library downtown. For a free event, I think it was pretty awesome. One of my coworkers has said that he likes to attend web-dev conferences so he can hear about/observe the latest tools and resources that others are using. I found this conference pretty helpful for the exact same reason. Not only did we get to listen to professionals speak about mostly interesting topics, but we were tipped off to other genealogy websites that they use often in their research. We stopped by the FamilySearch.org booth to talk to the volunteers there. They were able to give Kate some good info, but the moment I uttered the word “Irish” when asked about my research, they pretty much just laughed and said “good luck”. And, “hopefully his mother’s name wasn’t Mary”. “It was”, I sadly replied. They did have me talk to their one person with some knowledge in Irish research. Apparently there is a new database on FamilySearch.org that is not yet public – it’s in some sort of beta stage – that could be very valuable for Irish researchers. I’m not sure what it’s called, or even what it was exactly, but it was almost like a “family search” (ha) for very old Irish families; each result contained a person and their parents, but it wasn’t just a collection of personal family trees like you’d find on some search sites. None of the first few results were obviously my Anthony, and there were a lot of records that I’d like to sift through someday when they’re made available. The other tip the familysearch.org people gave us was that their website contains tons and tons of images that aren’t indexed. But you can browse them! I think that I had only really used their search before, and didn’t realize I could browse images that weren’t indexed. I’ve done this on Ancestry, when I know that my people should be in a census for a given year and place, but they didn’t show up in the indexed search results. I don’t know why it didn’t occur to me to use familysearch.org this way as well. 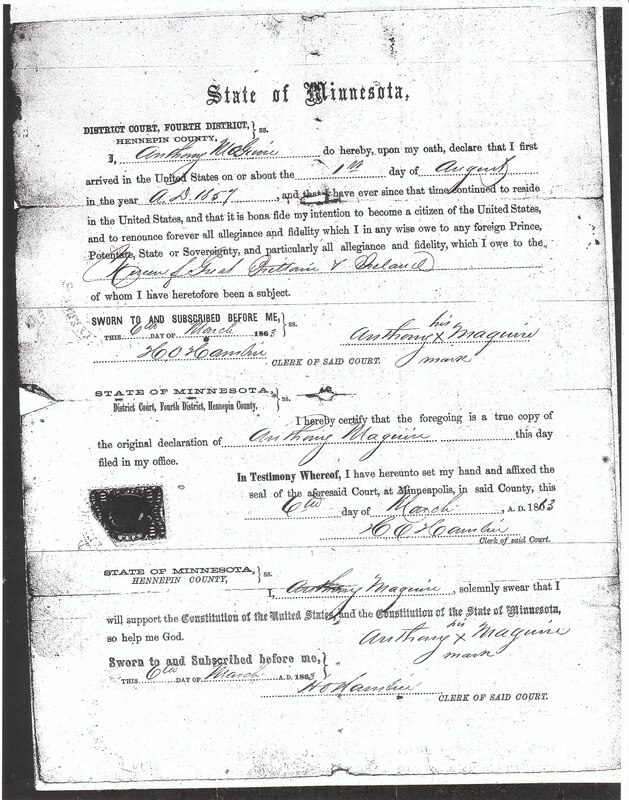 After browsing for a while this weekend, I discovered that all of those birth records that I found while spending time at the courthouse in Sibley county are available in their browsable images! These are the ones that I spent time transcribing while I was there, because they wouldn’t let me copy them. So, hooray for that. One of speakers I saw turned on a light bulb for me. She made me realize that I might not have Anthony’s complete Naturalization records. I think I only have Anthony’s Declaration of Intent (which pretty much gives you nothing, except that the person has denounced the king/president/leader/whatever of their homeland). I might be able to find Anthony’s Final Papers, which could possibly tell me more? When I was searching for these papers long, long ago at MNHS, I don’t remember the circumstances, or results (other than the Declaration of Intent). Maybe I did look for his final papers, and couldn’t find them? I guess that’s why I now have this blog, so I can remember what I did and when! In between two of the sessions, I spoke to Ann from IGS about my Anthony mystery. She agreed that I have quite a challenge. But she said that I should check the Catholic church records in St. Paul for Anthony’s marriage record to Bridget, as I only have the state/county record. She also said that engagements were typically 6 months, and the bride (or groom? I can’t remember) had to live in St. Paul for that time if they were getting married in St. Paul. If that’s true, and they were married on 12 Sept 1860, and the 1860 census was taken in April of that year, shouldn’t I be able to find one of them in the 1860 census? Why can’t I? 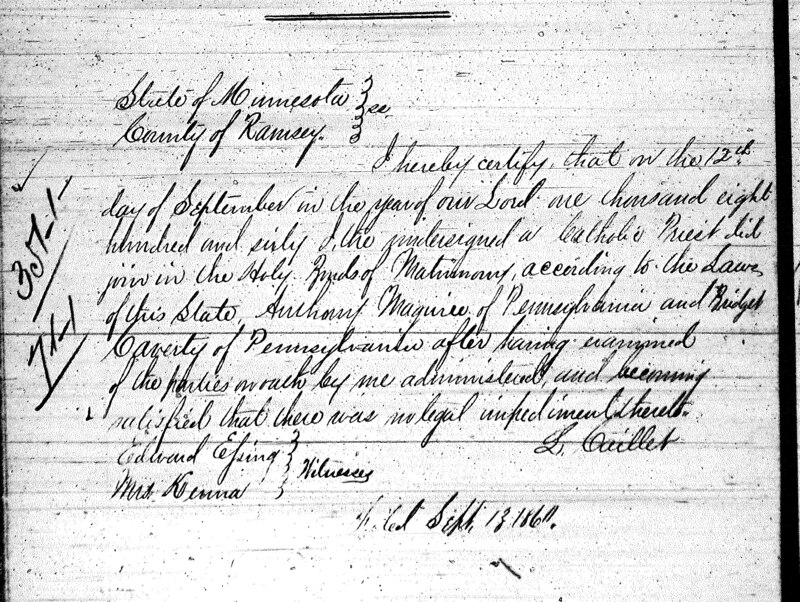 So tonight I’ve started reanalyzing the state/county marriage record I have for Anthony & Bridget in Saint Paul. It is signed by the Catholic priest that wed them, and lists two witnesses. (Wondering why I hadn’t dug into this before?). The priest’s name listed is L. Caillet. A little bit of Googling, and I found that his full name was Louis Eugene Caillet. He was born in France, and recruited to come to America to serve the Diocese of Saint Paul. 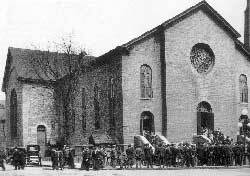 The book, Some letters of Monsignor Louis E. Caillet and August N. Chemidlin, 1868-1899 , says that on August 21, 1857, he became an ordained priest assigned to the Cathedral of St. Paul after the death of Bishop Cretin (first Roman Catholic Bishop of Saint Paul). I’m not Catholic, and call me ignorant, but I didn’t know what the difference between a Bishop and a Priest was. Wikipedia to the rescue? Catholic Church hierarchy. This, the fourth Cathedral of Saint Paul, was the dream of Archbishop John Ireland, who secured the site in 1904. The Archdiocese was growing and Ireland saw the need for a “great Cathedral” to replace the third Cathedral, which was 46 years old at the time and too small for the growing congregation. Now, if this is where they got married, where do I find the church records? It looks like they might have them at MNGS. So my plan: next Saturday is Irish Day at the MNGS, and I think I will try going to that again. In addition to the church records (which might tell me Bridget’s parent’s names, and maybe Anthony’s mother’s maiden name), if I can talk to the same woman I talked to briefly on Saturday, she might be able to give me more advice on where to go or what to do next. 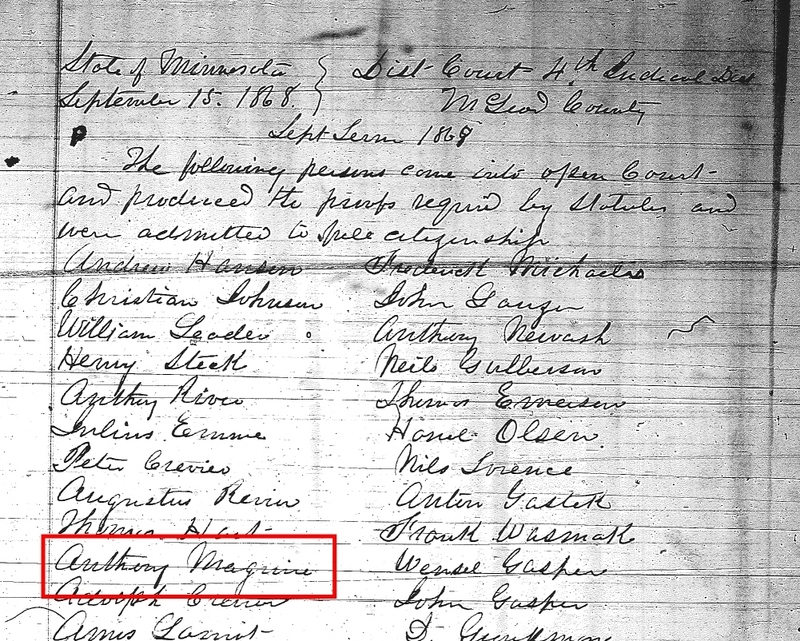 Oh, another TODO: dig into the witnesses that were listed on their marriage record: Edward Essing and Mrs. Kenna. On Labor Day, I made a trip out to Winsted to go walk through some cemeteries. I knew that I had some family buried in Holy Trinity Catholic Cemetery, but I didn’t really plan or make a list of the people I wanted to find. I just kind of went for it. And I found that there are a crap ton of Cafferty’s buried in that cemetery! I took photos of all of the Cafferty stones that I could find; I think I must have some sort of connection to some or all of them, I just don’t know how, yet. So for now, I’m just working on throwing them all up on findagrave.com, since none of them were on there. Hopefully that will help somebody out. Buried along with her were her parents, my great grandparents, Waddick Mochinske & Helen (Grzasewicz) Mochinske. And even more, Waddick’s father, my 2nd great grandfather, Lawrence Mochinski, as well as some other grand and great grand uncles. One day when I’m as obsessed with my Polish side as I currently am with my Irish side, I’ll be more excited about these finds. Or maybe not, because they haven’t been as difficult to track down as dear Anthony. Today I set off for the Minnesota Genealogical Society in South Saint Paul. I hadn’t been there before (whaaat? ), so it was kind of exciting for me. It was also their “Irish Day”, where they have volunteers that specialize in Irish research – exactly what I needed: some professional, expert help. A sweet old woman with an Irish surname sat down with me to help me figure out my Anthony mystery. I explained to her everything I know about him, and told her everything that I would like to know. One of the things that really makes him difficult is that I cannot connect him to any siblings or parents that also came to America. 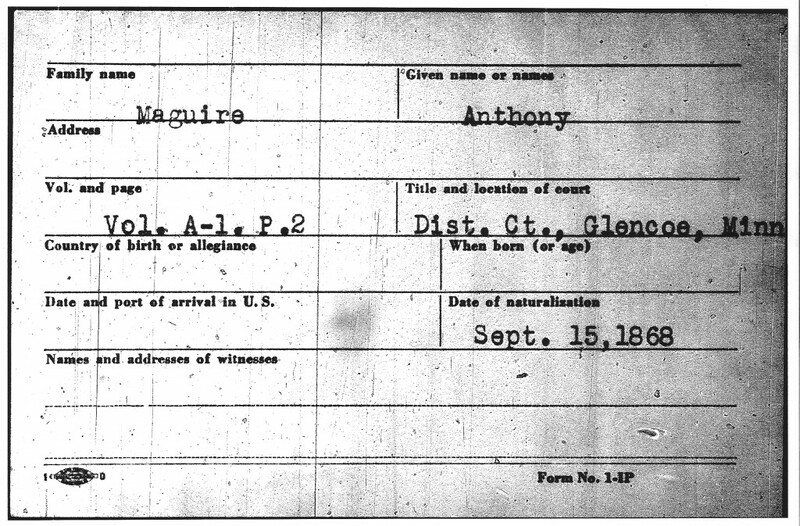 As far as I know, he came to America on his own, at age 17 in 1857 (sounds like something I would have done). We first looked at a book she had (can’t remember the title, and I didn’t write it down – shucks), to see how common Maguire/McGuire is as a surname. In 1890, there were 74 Maguires and 300-something McGuires in Ireland: a small number compared to the thousands of Sullivans, Murphys, Kellys, etc., but quite a lot compared to my other Irish surname, Cafferty, where there were only 6 in all of Ireland. Good news, I guess? A less common name might make it easier? The book also told us where these surnames were more prominent. The Maguire spelling was much more common in Fermanagh and other parts of Northern Ireland (I kind of already knew this after researching the Maguire surname on my own, but it was nice to have the confirmation). She also had some thoughts on the spelling: Maguire versus McGuire. She thought because it is written on his gravestone as Maguire, she would think that that is the way he preferred to spell it, because his family, the ones who took care of giving him the stone, would’ve known how he liked it spelled. I don’t know if I completely trust it though, because that family was really his wife’s family, the O’Mearas. Maybe they didn’t know him that well? But maybe they did? Also – Anthony could not read or write; would he have even had a preference? The Search for Missing Friends: Irish Immigrant Advertisements placed in the boston pilot. OF THOMAS MAGUIRE, native of the townland of Monion, county Fermanagh, Ireland; when last heard from, about fifteen months ago, he was in Cohoes, New York. Information of him will be received by his brother Patrick Maguire, Schenectady Locomotive Works, N.Y.; or his sister, May Ann Maguire, 1500 Pine Street, Philadelphia. The only reason I gave this one a glance is because Anthony had children named Patrick and Mary Ann, and it was (is?) very common to name your children after your parents, siblings, etc. In fact, it was pretty standard for the first son to be named after the father, and since Anthony’s father’s name was Patrick, I’d like to think that maybe Anthony had an older brother named Patrick. Anyway, maybe someday, when I prove that Anthony had any siblings, I’ll come back to this. Today I also learned that before Ellis Island was opened, people came in through Castle Garden, but a search there didn’t really give me anything good. And I was given a long list of websites for Irish research. Maybe once I’ve had a chance to check them out, I’ll post them here. But ultimately, it was decided that I needed track down obituaries, and try to find mention of any siblings that Anthony might have had, and a town or county in Ireland where he came from. So I thanked the lady for her help, left, and went straight to MNHS to search some newspapers. This is not my favorite genealogical activity. Old obituaries are hidden deep within the other content of the newspapers; they rarely had headings or anything to set them apart, and were often scattered around, so they’re difficult to find, and it’s very time consuming. I searched for Anthony in the nearby Belle Plaine Herald, as my friend at MNGS suggested (MNHS unfortunately does not have a Green Isle paper for 1882). No luck. I also checked for Martin McGuire’s obituary from 1937 in the the Minneapolis Journal, Tribune, and Star – a more recent death – perhaps I’d have better luck. Nope. I think I also checked for Margaret (McGuire) Davidson’s obituary: also no luck. So that was my genealogy day. Until next time.